"The 'Physicians Desk Reference' of the privacy world." "This is a handy compilation of privacy law instruments and a 'must' for anyone seeking guidance about the location and content of the key statutes, treaties, and recent developments." "The Privacy Law Sourcebook belongs front and center on the desk of every Information Age lawyer. It provides an indispensable map to the maze that is modern privacy law." 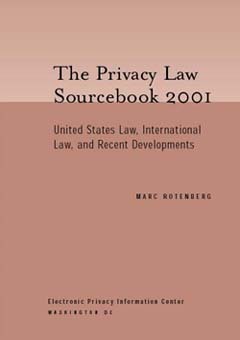 The Privacy Law Sourcebook is the leading resource for students, attorneys, researchers and journalists interested in privacy law in the United States and around the world. Includes the full texts of major privacy laws and directives such as the FCRA, the Privacy Act, FOIA, Family Educational Rights and Privacy Act, Right to Financial Privacy Act, Privacy Protection Act, Cable Communications Policy Act, ECPA, Video Privacy Protection Act, OECD Privacy Guidelines, OECD Cryptography Guidelines, and European Union Directives for both Data Protection and Telecommunications, as well as a fully up-to-date section on recent developments. The Privacy Law Sourcebook is updated and expanded for 2001 with information about the EU Standard Contract Clauses for Transfers of Personal Data, recent privacy legislation in Eastern Europe, and new summaries of key statutes for the non-specialist. Also included is an extensive section on privacy resources with useful web sites and contact information for privacy agencies, organizations, and publications.